A court martialed Confederate officer faces trial for running the notorious prison of war camp in Andersonville, Georgia, where over 14,000 Union prisoners died from disease, starvation and neglect. The defendant, Captain Henry Wirz, justified his actions with a plea that he was only following orders, believing he was relieved of any personal responsibility because he was performing his duty. However, the Army prosecutor contends that moral men must rebel against barbaric or inhumane orders, even if they are within the framework imposed by military discipline. 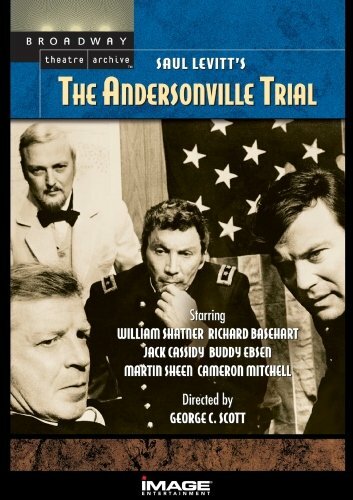 A powerhouse courtroom drama in the style of Inherit the Wind, A Few Good Men and The Caine Mutiny. With an all-star cast includes William Shatner (Star Trek), Martin Sheen (The West Wing), Cameron Mitchell (Carousel), Richard Baseheart (Being There), Jack Cassidy (The Eiger Sanction), Buddy Ebsen (The Beverly Hillbillies) and Alan Hale (Gilligan's Island). Directed by the celebrated George C. Scott (Patton), who starred in the original 1959 Broadway production. Winner of Three 1971 Emmy Awards: Outstanding Single Program, Drama or Comedy / Outstanding Writing Achievement in Drama, Adaptation / Outstanding Achievement in Technical Direction and Electronic Camerawork. If you have any questions about this product by Cameron, contact us by completing and submitting the form below. If you are looking for a specif part number, please include it with your message.